Marmaduke (2010) is adapted from the comic strip of the same name. 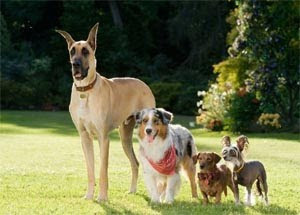 It centers on the daily living of Phil & Debbie Winslow, their three kids (Barbara, Brian, Sara), their mischievous Great Dane named Marmaduke, and their Balinese cat named Carlos. Phil moves his entire family from Kansas to Orange County in California to make a better living, at least that's what he thinks. As Phil struggles to impress his boss at work, Marmaduke is creating havoc in the canine world as he tries to fit into the pedigree crowd led by Bosco, the alpha dog at Dog Park. From left to right: Here's Marmaduke (voiced by Owen Wilson) with his "mud" friends, Mazie (voiced by Emma Stone), Raisin, and Giuseppe. "Mud" is referred to as the non-pedigrees in this movie. 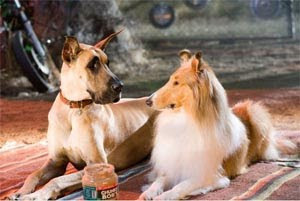 Here's Marmaduke with Jezebel (voiced by Fergie), his first girlfriend before he knows that Mazie likes him. Jezebel is actually Bosco's (voiced by Kiefer Sutherland) girlfriend. 1) Good family values. Family comes first. Take time to listen to what your kids really want to tell you, not what you think you understand or want for them. 2) Be who you are. There's beauty behind being honest with who you are. Faking and hiding behind certain facades in order to impress others will backfire if they are torn down. Bosco found out that Marmaduke was lying and began calling him all sorts of names - Marmapuke, Marmadukey, Marmafake, etc - in front of the whole dog crowd. All of them left him. Ouch, that really hurts.